Bring your party to Miami and take a 2-hour cruise along the beautiful scenery of Biscayne Bay! 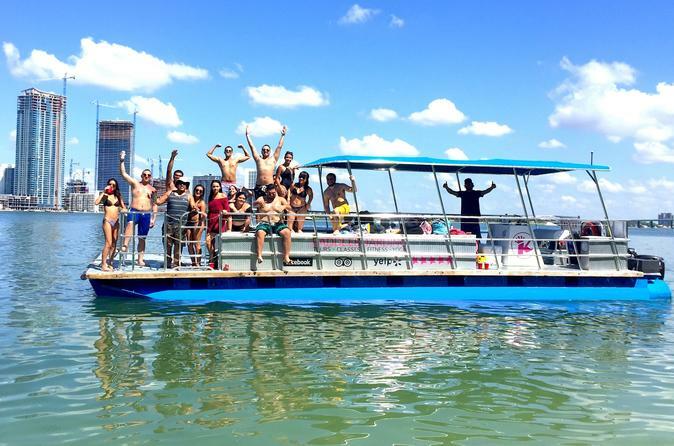 The 40' USCG0-approved Party Pontoon boat will comfortably carry you together with 15 friends and family for an unforgettable party cruise. Bring your own alcohol and enjoy our open deck boat for drinking and dancing to your own music via our sound system. Choose your own departure anytime between 9am to 6pm for a 2-hours of joy on the Miami and Miami Beach waterways! This boat will carry 16 friends and family, but must be booked by one individual traveler. After everyone and their belongings are aboard, you will cruise around the Sunset Harbor, enjoying the view of the exclusive private islands and their amazing properties. After 2 hours, the cruise will head back to the marina for you to continue the party at your next destination.